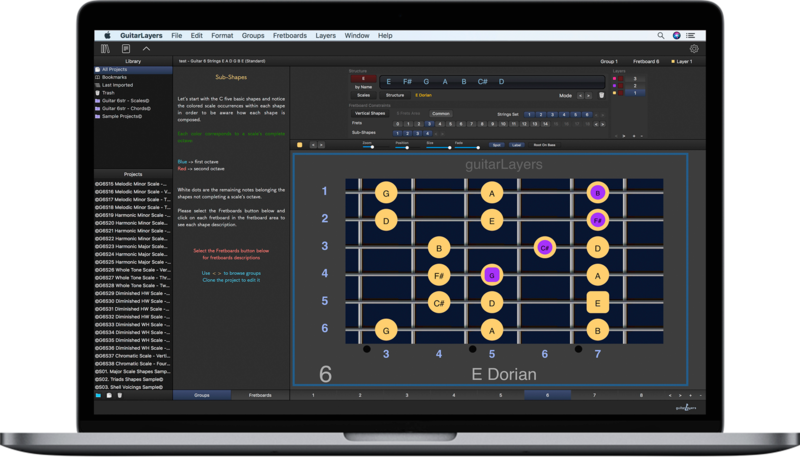 guitarLayers is a professional macOS guitar learning software. 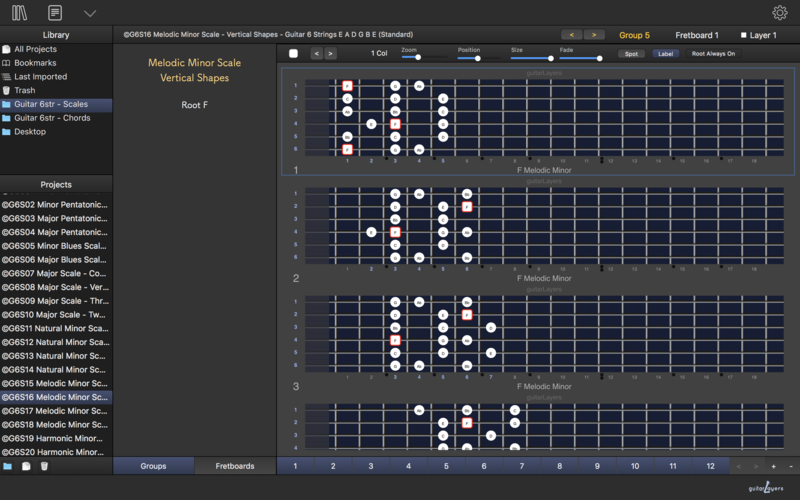 It allows you to visualize and manage, scales, chords and arpeggios shapes through a fully parametric control interface. 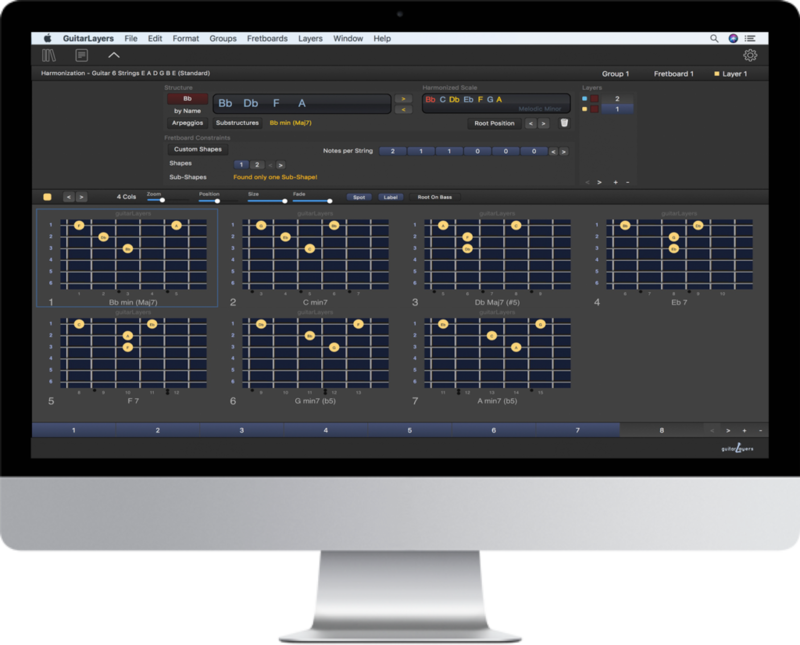 Moreover it enables you to visualize harmonic concepts by overlapping shapes on the guitar fretboard thanks to a powerful layering system. Manage shapes on the fretboard, according to the modern guitar theories. Visualize harmonic concepts by overlapping shapes on the fretboard. 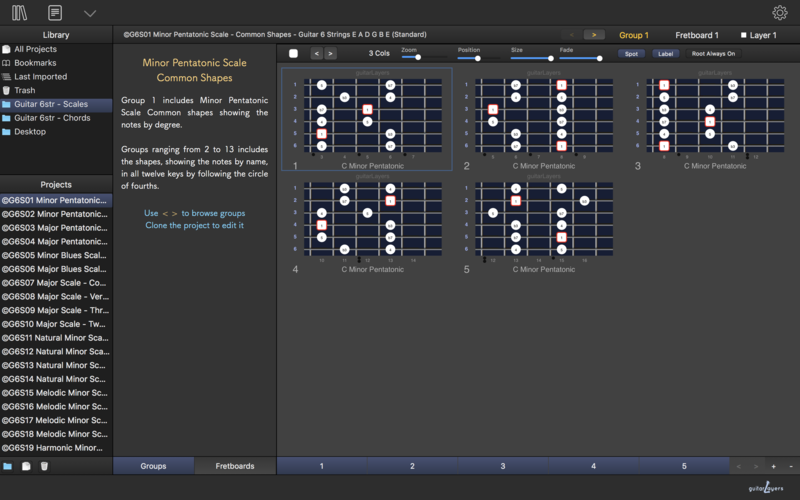 GuitarLayers enables you to visualize and manage common or custom scales, chords or arpeggios, on the guitar fretboard. You can, for instance, modify any single note of a common chord or build custom scale or chords note-by-note. 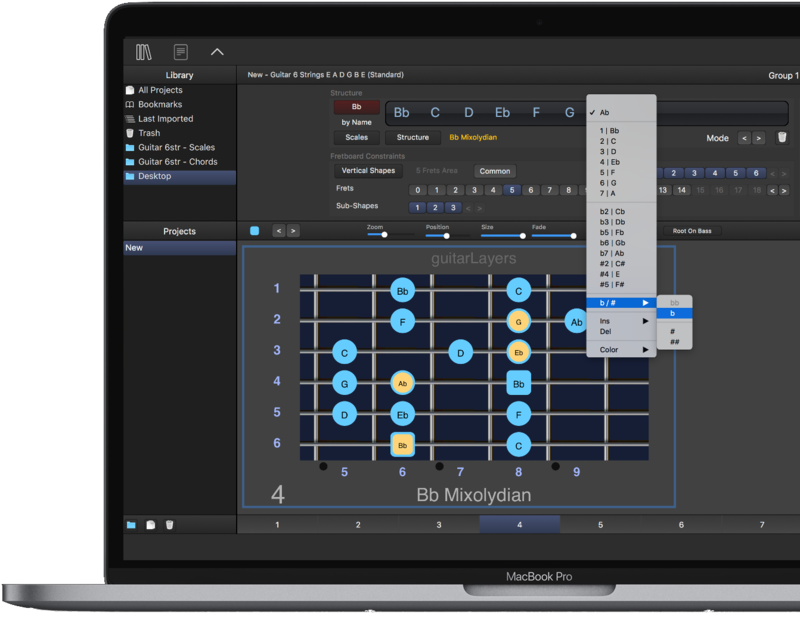 GuitarLayers allows you to generate Scales Modes, Chord Inversions, Drop Voicings and Equivalent Chords names, according to modern guitar theories. By applying guitarLayers Fretboard Constraints you can shape chords, scales or arpeggios on the fretboard by using a systematic approach. 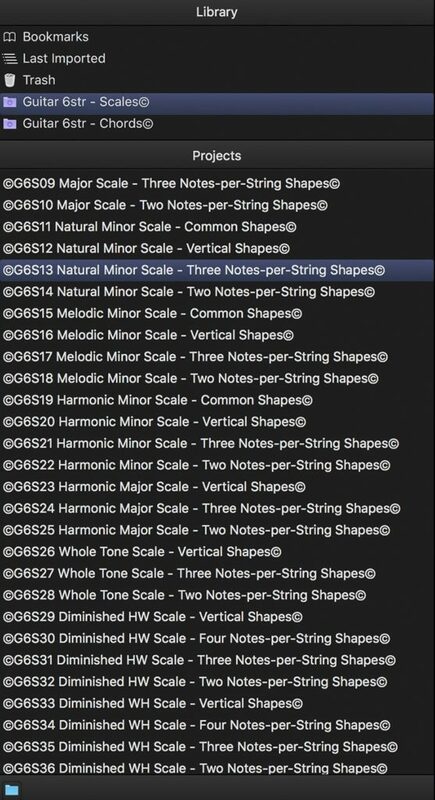 As a result you can generate Vertical shapes, Custom Notes-Per-String shapes, CAGED shapes, String Sets selections. So, do not waste your time by building shapes note-by-note but create them automatically with the speed of a click! As stated by the best guitarists, putting shapes in mutual relation on the fretboard is the key factor to visualize harmonic concepts. 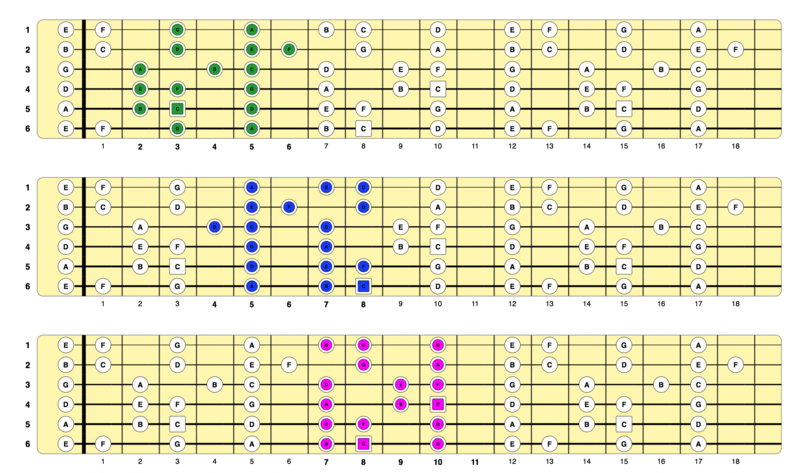 By using Layers you can overlap chords, scales or arpeggios in order to visualize them in a given fretboard portion. Moreover you can move the overlapped shapes together, in another position, automatically, with a single click. For instance you can overlap two scales, in order to see notes they have in common or not. 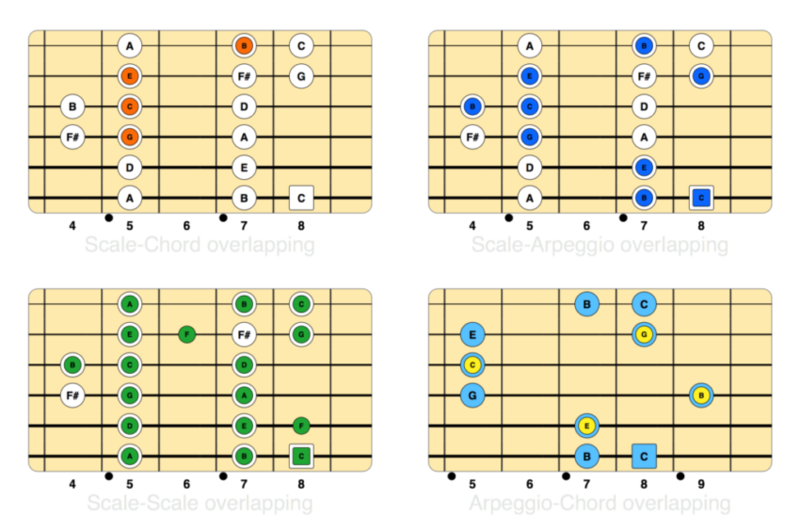 Even more you can build automatically useful and beautiful chord-scale or scale-arpeggio colored diagrams. 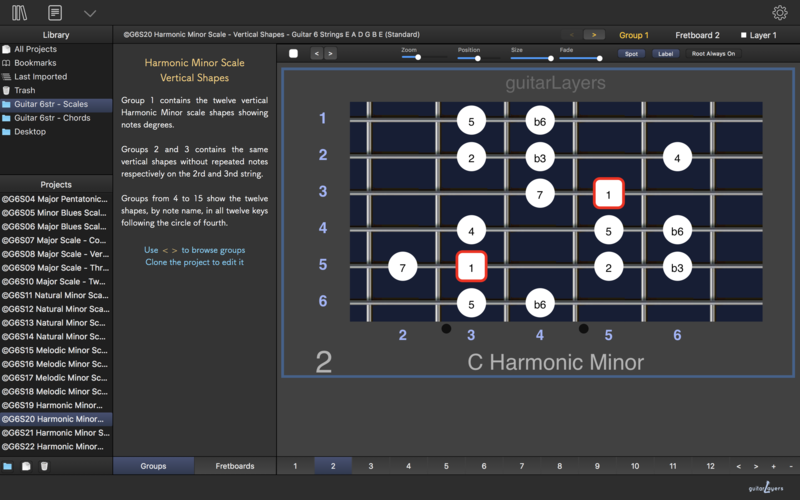 GuitarLayers allows you to harmonize automatically a given scale. Build chords or arpeggios by picking notes from a scale and then propagate them along each scale degree. In addition, the most brave and advanced users can also harmonize scales with custom chords or arpeggios and their related drop voicings and inversions. Think guitar fretboard like a piano player. 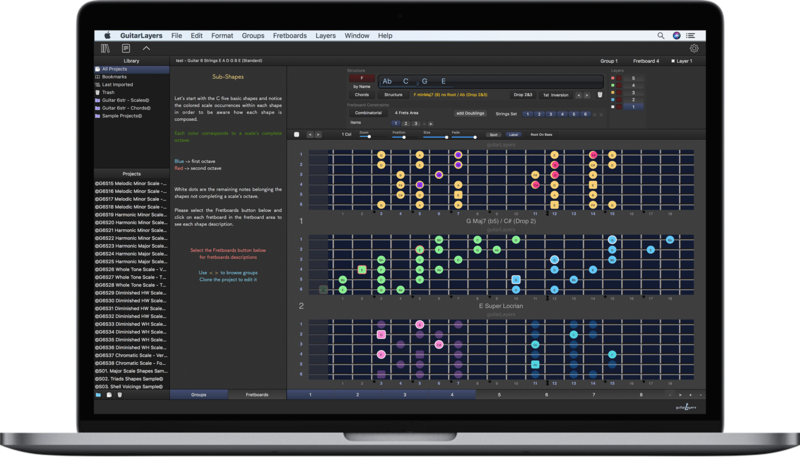 GuitarLayers intelligent engine recognizes equivalent structures: chords, scales and arpeggios with same notes but different harmonic function. So that you can play, for example, all the Cmaj7 voicings and inversions over a Amin9 or a D7sus4 chord! Not only 6 strings standard tuned guitar. Of course guitarLayers supports bass, from 4 to 7 strings, as well as guitars, from 7 to 10 strings, with different tunings. 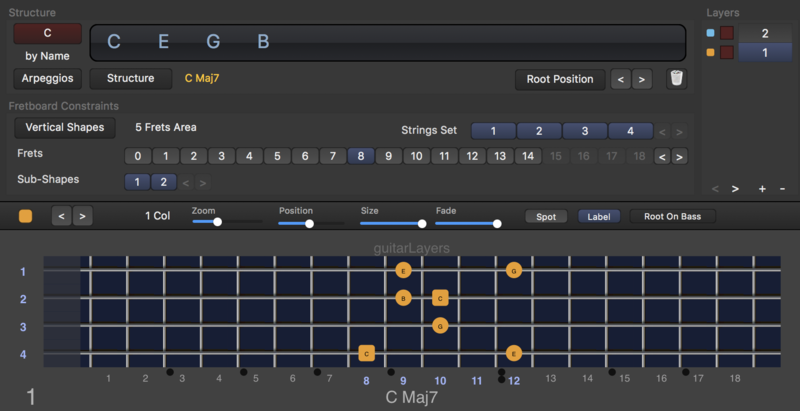 guitarLayers allows you to arrange fretboards layout in real-time by organizing them in single or multiple columns visualizations. Moreover you can organize your contents in groups of fretboards ready to be browsed like the slides of a presentation software. Furthermore powerful “copy and paste” functions let you save a huge amount of time when creating scales or chord libraries. GuitarLayers library includes a set of projects, pre-compiled by professional guitarists, containing shapes of the most used scales and chords. All shapes are organized in a systematic and rational way. Use guitarLayers to print or export your diagrams as PDF or images with or without background. 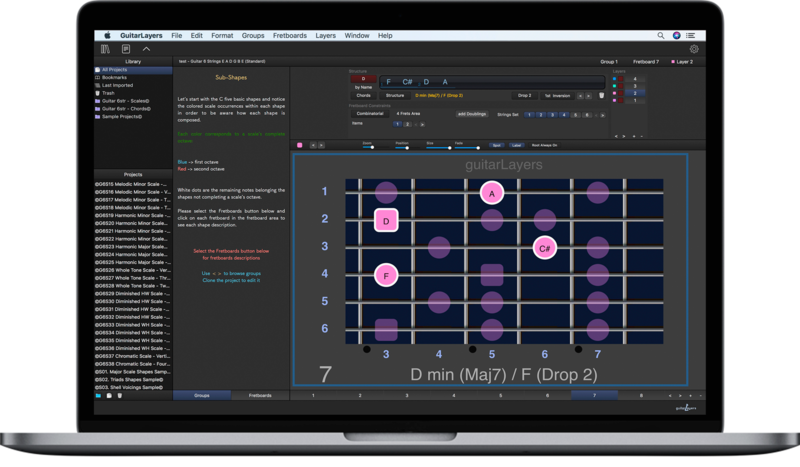 Now you can quickly copy and paste an entire multi-fretboards diagram or a single fretboard from guitarLayers to your favorite presentation software. Even more you can create diagrams ready to be embedded in your videos or blog posts. "This is the application I missed to really learn the composition of chords, scales and arpeggios for the guitar. Highly visual, the layer system allows you to really understand the theory in depth. Everything is possible with this application and, above all, everything becomes clear!" 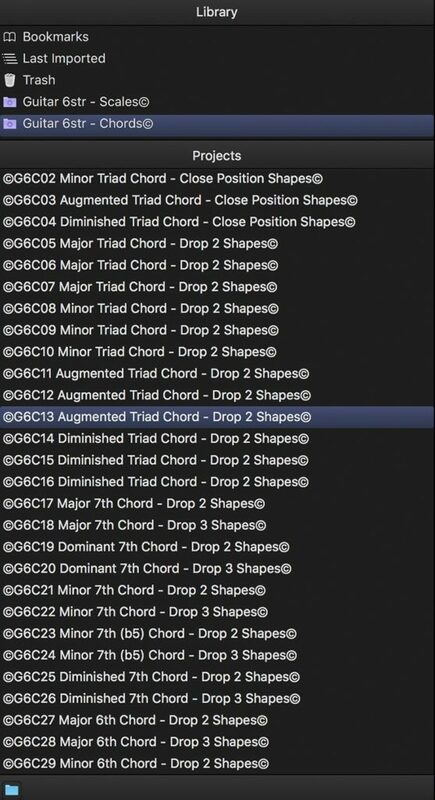 "This piece of software has been great for reviewing my notes, scales, harmonies, chords, triads, complex chords and polytonal chords, for experimenting with different structures and theoretical concepts and for teaching students Music theory and structures based on simple building blocks to build complex theoretical structures for composition." "After using it for a few days, much of the fragmented theory that I had picked up over time suddenly started to become more meaningful. The overall impression is that GuitarLayers is a well thought out app for those learning guitar. It can be used at various levels from practice/study to a fairly comprehensive lookup reference, whilst also catering for tutors who wish to set structured development plans for their students." "With it, I can combine, visually and practically all the music concepts about learning guitar technique and applied theory that I’ve learned from the greatest guitarist/educators as Mick Goodrick and Tim Miller. 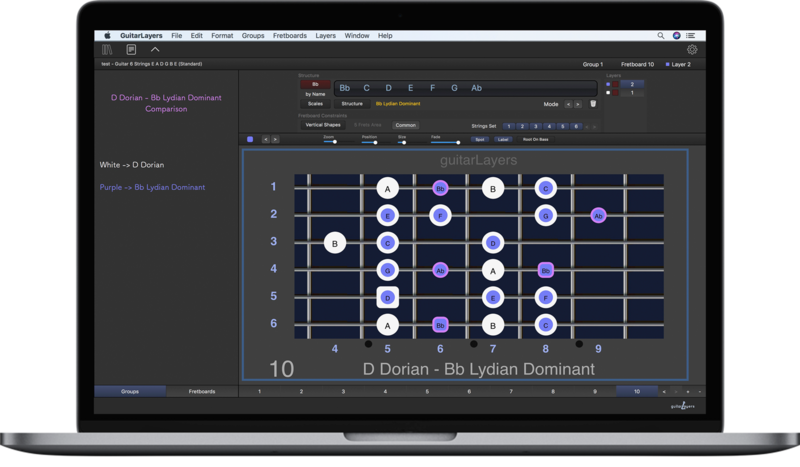 Because of its great potential, GuitarLayers can take both students and advanced guitarists into a very deep understanding of the guitar harmonic mechanisms and theory, all of these ready to be viewed and applied to our fretboard with just a simple click." Whatch the video tutorials and examples!